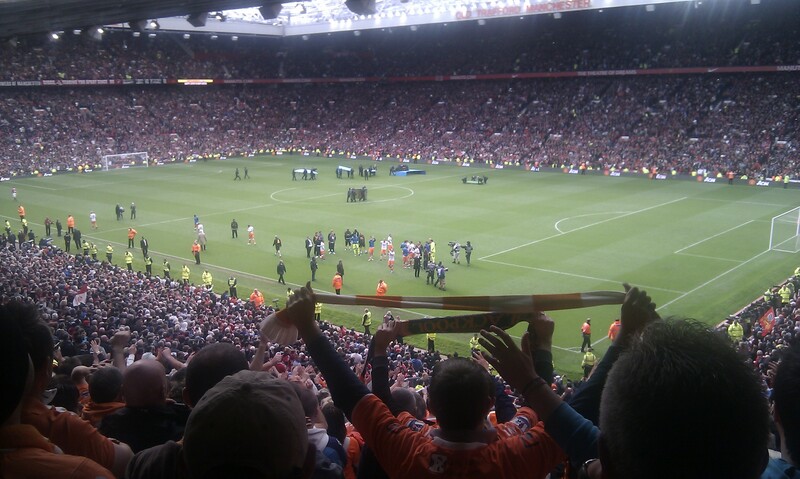 It’s been more than a week since Blackpool were relegated at Old Trafford, but I have yet to articulate my thoughts on the blog, either on the game itself or the subsequent relegation. Unfortunately personal circumstances have meant I have had neither the time nor the energy to do this in the past seven days, and a report of the Man United game now seems barely relevant. For the best account of the events of 22nd May, Tangerine Dreaming’s report is a must-read, if you haven’t already done so. With the dust starting to settle though, it is now time to cast an eye back over the events of the last 12 months. Picking through the pieces of a memorable season, I’ll be posting a series of articles in the coming week analysing where ‘Pool’s season went wrong, and to whom any blame should be apportioned. Keep ’em peeled. After an amazing season in the Premier League it’s now time to start reflecting on a superb experience. First up are the awards picking out a few points from the season. The awards are entirely subjective and not formed through consultation and aren’t necessarily backed up with facts. However, (where applicable) further end of season articles will serve to cover the whys, wherefores and the greater detail etc. Alex McLeish employed a restrictive diamond formation both home and away against Blackpool and the upshot was the the centre space was virtually eliminated and Blackpool were too slow to react to find space elsewhere. McLeish was the first manager to clearly spend time thinking about playing Blackpool and it paid off reducing Ian Holloway’s men to two stale performances. Mick McCarthy win this one in moving Michael Mancienne to right back to counter the threat of Luke Varney from Blackpool’s long diagonal balls. McCarthy sent his team out at Bloomfield Road with Kevin Foley at right back and Michael Mancienne in a holding midfield role. Blackpool enjoyed early success from that route and McCarthy was quick to change and it was a change that sparked a chain reaction, leading to the game being a close encounter as the match progressed. Owen Coyle spent the first half of the game against Blackpool at the Reebok seeing his 4-4-2 structure being exposed time after time. He didn’t seem to recognise what was going on until the second half when he decided to send on Martin Petrov, Rodrigo Moreno and Ivan Klasnic. Their passing as a team became better and eventually secured a draw, however, it was really ‘the kitchen sink’ treatment not by design, more through sheer panic. Still, it worked. Ryan Giggs – His speed and movement seemed to spark Manchester United in to life when the game was threatening to get away from them. Incisive, quick runs and thoughtful passing saw Blackpool opened up time after time. David Silva – his technical abilities are supreme, but the fact he ghosted around Bloomfield was a sight to behold. Space exists for Silva to fill. Enough said. Luka Modric – Just a brilliant footballer and didn’t deserve to be on the losing side at all at Bloomfield Road. Short, consistent passing all game long combined with a sense of when to make a break forward and get beyond the defensive line. Luka Modric – see above. It was a privilege and pleasure to witness him pass the ball over 180 minutes this season. Bolton’s season was plastered together by two players. A brave statement which won’t be backed up here, but Stuart Holden’s energy held their flat midfield together at times, when he got injured Daniel Sturridge’s opportunism and desire to prove a point picked up some valuable points to keep them afloat. At 3-2 up away against a good Premier League team may well require some tactical tweaks to contain, or you could try and keep the status quo. Ian Holloway chose to do something that went against his philosophy against Everton and did something that wasn’t thought through or drilled in training. 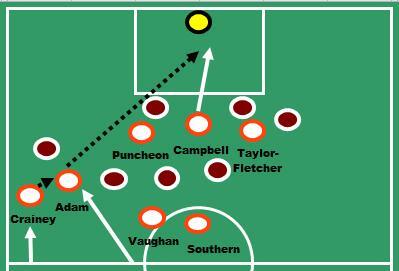 He made two defensive substitutions, turning Blackpool in to a 5-4-1 and chaos ensued with Blackpool losing the match 5-3. Ian Holloway gets this to make up for the previous one. His decision to go to a 3-5-2 when 3-0 down to Wigan led to a much flatter midfield three and convinced him that he had to return to his midfield set up that guided them through the Championship. When Blackpool romped home 4-0 at the DW Stadium earlier in the season Wigan looked disjointed and had their fragile confidence shattered by poor goalkeeping from Chris Kirkland. Oh, and they didn’t have Charles N’Zogbia. Martinez made a great decision in dropping Kirkland soon after and the re-integration of N’Zogbia, gave them a direct goal threat as well as unpredictability in the final third. When Wigan (complete with the Frenchman and Ali Al-Habsi in goal) came to Bloomfield Road in April they were a different side, dictated the game and looked like a team focused on their game plan and their greater plan of staying in the Premier League. Opposition players are just obstacles for Carlos Tevez to get around. In doing so against Blackpool he just kept taking men out of the game making it very hard to defend against a very strong team. Gonzalo Jara – When you’ve just seen your side reduced to ten men with a debatable decision, the last thing you should do is take man and ball when the game is stuck in the corner and no danger is apparent. Not Jara, he acted first, thought last and then had a shower. Charlie Adam’s first time passing can sometimes be played out of the vision of some Blackpool players. Adam is likely to pass at any moment, over any range and at any pace. Adam’s first time pass away to West Brom was perfectly executed and showed vision and inspiration that becomes hard to defend against but easy to admire. DJ Campbell v Spurs – This goal was a classic counter attack, fast running, clever touches, turning a defence on it’s heels and a composed finish by Campbell all combined with a little good fortune. Luke Varney v Wolves – Superbly struck volley stunning Wolves and most spectators at Bloomfield. Charlie Adam v Blackburn – At 1-0 up, Adam clipped a perfect free-kick out of the reach of Paul Robinson to make it 2-0 at Ewood Park. David Silva’s turn and shot at Bloomfield Road was a sight to behold. Crafty, cunning, balanced and one of those goals that even the Blackpool players probably wanted to applaud. Those were a few awards to remember just a small collection of memories of Blackpool’s season in the Premier League. Check back here later in the week for a few posts looking back at the season that was. There’s little point in conducting a detailed post-mortem on the game at Old Trafford, by now everyone knows the outcome, everyone knows the consequences of that outcome. Blackpool fans worldwide are cycling through the emotions that hit us all in times of heartbreak and despair. Hearts are broken but dreams were made and our dreams will never die. The dreaming continues and the pain will subside, the sadness fades with each passing hour and hours become days, weeks become months and soon the optimism will return. The tide has gone out by the seaside, but it will soon return and a fresh patch of wet sand will emerge and the footprints on that sand will be of the next generation of Blackpool players to take this club on to its next chapter. The game at Old Trafford summed up the season that Blackpool had, excellent on the ball, chances being created, goals being scored. Drive, determination, passion and commitment graced that pitch, however, the defensive frailty that has been apparent all season long came back to kill them off. Manchester United eased up a gear or two and with that the Blackpool defensive line was pulled back to front and side to side, twisted and turned inside out, till the pressure became too much to bear. As predicted the game was open, even if the line ups were too hard to call given the pressures that the hosts had elsewhere. Blackpool may well have broken the deadlock early on, decisive passing and drive first put Keith Southern and then Gary Taylor-Fletcher within yards of the goal, only for composure to evaporate in front of the Stretford End. The first Manchester United goal was picked out in the preview, Berbatov pulling out to the wide right to latch on to a ball from the deep. Park Ji-Sung finishing superbly after being given a yard by Ian Evatt. Give a yard to a footballer at this level and you might as well give him ten. Blackpool responded, in truth Manchester United looked happy to let them have the ball and Blackpool were happy to have it, caressing it about the pitch, working it along their back line and in to midfield. However, as they stepped in to the final third the Manchester back line snapped at the Blackpool heels and refused to let them turn on goal. Blackpool did get chances, but they had to work ridiculously hard for them. Their midfield three took it in turns to step higher up the pitch to pressurise Scholes in the deep and Fletcher roaming free. The goals came from familiar routes for Blackpool, a set piece and then a deft passing move. Charlie Adam and Gary Taylor-Fletcher getting the goals, the former drawing plaudits all season long, but really it’s the latter whom encapsulates what has been so good about Blackpool this season. Taylor-Fletcher when standing next to the athletic physiques of a Premier League footballer looks like your average bloke, but his mind is razor sharp and he plays strongly with an imagination that many a footballer just can never possess. As the game wore on Sir Alex Ferguson made a few changes bringing on talent that showed he is a winner and his team are winners too and that is what happened. Stephen Crainey had pushed Nani back and away from goal, and stopped him from running at him in a one on one situation. However, Ferguson switching his wide men proved to cause enough doubt in the mind of Neil Eardley at times, forgetting his assignment and affording too much space to a critical attacking threat. Which added to Eardley’s cheap concession of the ball assisted in the pressure being ratcheted up to a notch that caused the defensive line to buckle and the game was lost. Great season. Great players. Great memories. Having a final game against Manchester United was perfect in so many ways, a contrast on many levels and in so many ways (too many for this post). After the Blackpool squad trudged with dejection towards the tunnel, the preparations for a party were just beginning and not long after, came the procession. It was led by a celebration of the Manchester United backroom staff and after all twenty-something of their coaches came on to the pitch it was apparent that football at this level needs structures around the first team that nurtures and supports each player week in week out. Before the season started Ian Holloway had an assistant, a physio and a part time goalkeeping coach. Last minute shuffling and recruitment upped those numbers marginally so that another coach came in, someone could offer guidance around fitness, analyse performance and train goalkeepers on a full time basis. It was breathtaking to see Manchester United’s troupe of coaches walking out on to the pitch, to the casual observer you’d have thought it was their first team. They were professional and they were bristling with pride, content and satisfied with a season of work. It’s a testament to the work that Ferguson puts in, team talks and tactics are a fraction of what he has built and listening to Holloway’s press conference afterwards, you can see that he has aspirations to build Blackpool back up, but build them as a club to sustain Premier League football. This has come too soon for a club of Blackpool’s size, they weren’t supposed to get promoted, the club officials didn’t expect a manager to bond and blend a side together and turn them from potential League One material to a side who could grace the biggest stages in the land. Some teams prepare ‘projects’ designed to get in to the Premier League, they invest in fat fees and salaries and park up at a freshly built stadium complete with sponsorship from multinationals and backed with the drive and commitment of a board intent on breaking in to a market or the Premier League as it is also known. Now Blackpool’s return to the Football League has been confirmed you’ll note that this blog post has changed somewhat, it might be more (or less) fluent and less focused on the rational. There may be a little more narrative, a little opinion or two. That is a conscious choice, perhaps an acknowledgement that to ‘chalkboard’ this match is a little futile. I could probably back up my earlier observations if I had the energy, in fact you might have noticed that I’ve slipped in to the first person for the first time on the blog. I hope you’ll allow me to do that for now. I hope you have enjoyed what I’ve tried to do on the blog this season, I’ve enjoyed every minute of doing this and every single minute of the season. Each season comes and goes, but this one was that little bit special. Going to those grounds you normally see on tv, hearing those familiar voices talk about your club, your players. I’d normally take in a couple of Premier League games with my regulation Blackpool medicine and I was always fascinated with the speed and technical precision of the game at the highest level. I once saw Arsenal draw 1-1 with Liverpool at Anfield, I remember seeing Cesc Fabregas dominate the game with supreme passing, movement and awareness of tempo. In the same game I remember thinking that Kolo Toure was carrying a lot of timber for a footballer but still shifted at a rate of knots that left me gawping. A game at Bloomfield wasn’t like this. We’d marvel at the maverick genius of Wesley Hoolahan or roll on a Nolan (never sure which one) at the start of a season for a comedic kick off. The hope would come once a year that we might play Liverpool or Manchester United in a cup game, occasionally we drew a big club and the fever swept the coast. However, in the back of my mind I could never imagine our players trotting out at Anfield, they weren’t good enough, strong enough, quick enough or big enough. Our shirts weren’t tailored the same, not made by Adidas or Nike, we didn’t have drinks crates on the side lines. All those seemingly silly things stood out as a contrast, the Premier League was about supreme talent in stadiums rich with tradition and history. I never seriously thought I’d be here after a season of seeing my team in the Premier League and I never thought I’d feel so sad about leaving it. At the start of the season I was happy to have a good season and return to the Championship. However, we football supporters become consumed in anything that we are doing in the moment and those moments captivated me and I realised that our team was capable of playing Premier League football, they were as good, were as fast as other teams and when they shot at goal they could swerve it and move the ball in the air. With all that was the realisation that I cared, I cared because I wanted another season and another season in this league. Why? One reason, the gap isn’t that far, these footballers aren’t on another planet. They are beatable, they are humans, they just work in the confines of greater structures and have been exposed to different levels of conditioning. Sat this season in Anfield, not far from where I saw that Liverpool v Arsenal game I saw my team turn in a near faultless first half to put Liverpool behind by two goals. It was unreal, surreal, but yet reading the results and watching it later made it real and it was real. We deserved that game, we deserved every game we won with the exception of one (Spurs at home), we played on the front foot, we attacked. We lost more than we won, but the sadness lingers around those results that we couldn’t close out from winning positions. Holloway tried a plan B, but for a plan B it helps if you have a deep squad and another mind or two to assist you with the strategy and another mind or two to help practice that. However, right now I feel sad that we couldn’t achieve the impossible. We gave it everything, but it wasn’t quite enough. This world doesn’t always reward the aesthetic or the cultured aspect of humanity, life is tough, life is nasty, brutish and short (thanks Hobbes). I believe in the good of this life, the beauty of this world, for purity and joy. For art and for science. Cynicism and treachery hold no place in my soul. Being upfront and passionate are integral, bullying and physicality are traits best rid out of the world. For Blackpool, we tried to do things differently, perhaps we have set a precedent, perhaps clubs will learn from what we did. Looking at Swansea then perhaps there has already been a shift in the way clubs are thinking. Hopefully, more clubs will come up and try and cultivate footballers rather than athletes and try to string patterns of play together that see the ball hug the grass. Perhaps not, as a Premier League season is nasty, it can be brutish and for Blackpool it was short. Gone, but never forgotten. True footballers. I’m sad that this signals the end of an era. Of the starting eleven yesterday, eight of the players were brought to the club prior to Ian Holloway’s arrival. We’ve seen those players flourish under his tutelage and become ‘proper’ footballers like what you see on the telly an’ all. It’s sad that I’ll never see David Vaughan do his pre-match shuttle runs, or chase a lost cause or exchange passes with Charlie Adam whilst in a tangerine shirt. Sad for the loss of all the players, whilst knowing that they have brilliant chances to further their careers elsewhere. I hope you’ve kept reading this post as it wandered down the page from match report to quasi diary entry with flickered notes of emotion, stifled by the rawness of this moment and the lack of ability on my behalf to write as lucidly as a more seasoned author might. I hope you’ve enjoyed all I’ve tried to do on this blog and I hope you enjoy the posts that come in the next couple of weeks as I put forward my highlights of the season and review from a tactical and statistical point of view where things went right and wrong for Blackpool. I may wake from this dream soon, but only briefly before I close my eyes again and dream once more. The final game of the season and the champions host Blackpool in what could be their last Premier League game. The outcome of this game alone will not necessarily control Blackpool’s destiny unless the Tangerines achieve the impossible and win at Old Trafford. Given that Sir Alex Ferguson may well rest several of his players in advance of their Champions League final against Barcelona then their line up is a matter of guess-work. However, after the possible line ups have been introduced, this article will focus on some of the theoretical battles that may emerge during the game that may well go a long way to deciding if the Tangerines are still dreaming come the start of the 2011/12 season. How will Manchester United line up? Here's it's somewhere between a 4-4-2 and 4-3-3. Will Anderson play? The Manchester United line up is going to be tricky to call and as a result, their shape difficult to fix. The suggestion above sees their shape being a loose 4-4-2 with Michael Owen and Dimitar Berbatov up front. Quite possibly Darren Fletcher may come in to the centre where his energy would benefit a 4-4-2 against a 4-3-3. Nani may well line up on either flank, but wherever he lines up it can be taken as a given that he will push forward and attack. If Anderson plays then his role may well be pivotal to their approach. Should he sit narrow as above then that will help Man United match up against Blackpool’s midfield three, the teams who’ve done something similar against Blackpool’s 4-3-3 have had the most success this season. Ian Holloway will play the eleven who started the match against Bolton in his usual 4-3-3 with his new-found flatter shape in midfield. It is possible that both teams will have the same attacking philosophy and the game will be wide open with play stretched across the length and width of the pitch allowing space to open up everywhere. Holloway may ask his full backs to commit to the attack and in addition, his centre backs to step up and launch attacks. In fact Blackpool will go all out for a win in this fixture, Holloway will not be thinking of a cagey opening 20 minutes keeping things tight and building from there. That just doesn’t happen with this Blackpool side. Ferguson might have a loose strategy within this game. An emphasis on attack, yes, but perhaps he might ask the likes of Darren Fletcher to rehearse patterns of movement that might be explored in the Champions League final. He might be happy for Patrice Evra to progress forward for left back and ask his centre backs to cover for him. This article will now pick out three battles that might prove pivotal in the final breakdown. Both sides will utilise their wide men to break down each others defences, however, it is the application of Blackpool’s full backs that could be crucial. Under Ian Holloway Blackpool’s full backs have progressed in to attack on many occasions and as Blackpool go on an all out attack in this game then Stephen Crainey and Neil Eardley will progress high up the pitch. This will present a problem for Blackpool as it has done on occasion this season. As you can see below Manchester United might try to work a position for a midfielder to exploit through balls in behind Stephen Crainey to release Nani, who in turn will be in the perfect position to find his forwards in the box. Holloway will be well aware of this threat and he could counter this basically, by asking his full backs to recover their position quickly and for David Vaughan and Charlie Adam to track back and support from midfield. However, he may well ask his full backs to attack relentlessly so that Ferguson’s wide men are running back to their own goal more often than not. This ploy hangs off Blackpool being able to gain a foothold in the midfield first in order to set up attacking plays which leads on to the next key battle. As most observers will know, Charlie Adam has had a good season for Blackpool and has created and scored goals all throughout the season. When he has struggled it is because teams deny him the space to work on the ball. Ferguson might field Darren Fletcher in the centre of midfield to close down that space to panic Adam and hurry him up in to making mistakes. Ferguson might do this to assert control in this game, but he might have very specific plans for Fletcher (fitness withstanding) to take in to the Champions League final to counter Barcelona’s fluid midfield. If this doesn’t prove to be the case and Adam settles in to the game and finds his passing rhythm, he will attempt his long diagonal passes and he will also be a threat with his set piece delivery. However, he will look to break in to the attacking third down the left side. With the support of Stephen Crainey he can build himself in to one of his favoured positions to deliver deft balls over and in between the defence to release DJ Campbell through on goals. You can see this demonstrated below. After Crainey breaks forward, Adam will join him looking to play angled cross balls in to the box for DJ Campbell runs. This was the position that Blackpool built themselves in to last week against Bolton and Manchester United’s defensive line will have to be alive to this threat and not get caught on their heels like Bolton did last week. One of the observations of the meeting between these two teams at Bloomfield Road was the intelligent movement of Berbatov. He appeared to work himself in between the right full back and right-sided centre back. 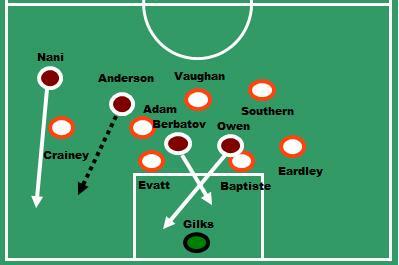 At the time of the game Blackpool were suffering when teams attacked their right back area, so it might have been a game specific plan, but more likely it is down to Berbatov’s instinct. This is again something that Blackpool will have to be wary of and as a demonstration of the point, you can see how it might look below. Berbatov will keep moving and should he peel off the shoulder of a defender in to space, then it will may well be a ball from deep that he latches on to. Blackpool’s defence have struggled to read teams that play clever balls from deep and they will need to be alert to the threat that when that happens, Berbatov will be on the move and will have to be tracked. Paul Scholes will look to put on a passing masterclass and he averages eight long balls per game and it is likely that the Scholes/Berbatov combination could prove lethal. This will be a tremendous game, Ferguson may well see this as a chance to rehearse some set moves against a team that line up in a 4-3-3, which could be useful for their Champions League aspirations. Blackpool on the other hand will try all game long to keep scoring and win or lose this game, they will not necessarily fall. If Blackpool do fall, then it will be with their heads held high and with a very proud set of supporters who’ve enjoyed a season that they’ve been dreaming about for years. Ian Holloway’s team selection is never straightforward to guess, but like at the end of last season, he may have finally hit upon his best starting XI. He has kept faith with the 10 of the same players for the last four games, only changing one of the forward positions. Matt Phillips and Sergei Kornilenko have both fulfilled this role, but it is Jason Puncheon who now appears to have made this position his own going into the final weekend. Only Puncheon and Neal Eardley did not start against Cardiff at Wembley in last season’s Championship play-off final – Brett Ormerod and the on-loan Seamus Coleman did play that day. It’s incredible to think that these players, who were unfancied second tier players only a year or so ago, are the same players who have helped ‘Pool find a little form at the crucial moment. With a positive result all but necessary, it’s likely that Holloway will, as usual, mainly fill his bench with attacking players. Phillips, Ormerod, Kornilenko, James Beattie and Marlon Harewood are all potential options – I would anticipate Holloway will go for all five forwards, plus Craig Cathcart and Richard Kingson as his substitutes. Midfielders Elliot Grandin, Andy Reid and Ludovic Sylvestre will probably all have to settle for a view from the stands. Matt Gilks, Stephen Crainey and David Vaughan could all be making their final appearance in a tangerine shirt, but all eyes will be on Charlie Adam who will almost inevitably be playing one last time for Blackpool. Nominated for the PFA Player of the Year award, Adam has been the talisman, his goal against Bolton hopefully signalling he is back to his best form. It’s been a trying few months for Adam since the January transfer window closed, but despite looking to advance his career, it’s clear to anyone who has followed ‘Pool closely that he does genuinely care for the club and its supporters. Could Adam say farewell with a free-kick or penalty to keep Blackpool in the Premier League? 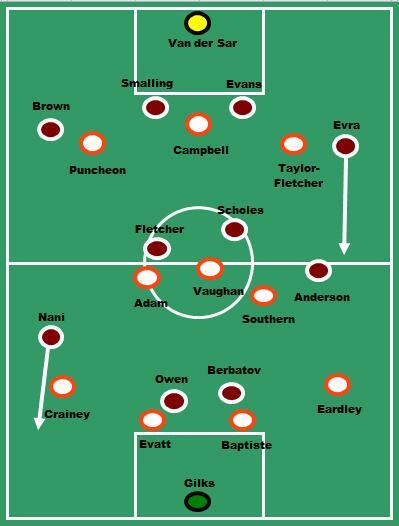 If Blackpool’s line-up practically picks itself tomorrow, then United’s is somewhat more tricky to predict. The Champions League final against Barcelona awaits – only six days after the game at Old Trafford – and one eye is naturally on that tie. There has been a lot of discussion in the build-up about Man United fielding a second-choice team, and what exactly constitutes a weakened team. Sir Alex Ferguson has sought to ease the fears of other teams involved in the relegation dogfight however, insisting a number of regulars will start on Sunday. The players named were Edwin van der Sar, Patrice Evra, Anderson, Darren Fletcher, Paul Scholes and Dimitar Berbatov. Those who will play alongside them is as yet unknown but it could include the likes of Wes Brown, Jonny Evans, John O’Shea, Darron Gibson and Michael Owen. In effect, a team that still features a host of internationals and players that earn a lot more than Blackpool’s first choice XI. United have been criticised this season for perhaps not being worthy of comparison to great teams of years gone by, but nobody can argue with their 19th title win, which they sealed with a draw at Ewood Park last season. Most formidably, they have only dropped points in one home game all season, against West Brom helped in no small part by a rare van der Sar clanger. The omens for a positive result for Blackpool do not look good. ‘Pool have had a tough 2011 with just three wins since the turn of the year against Liverpool, Spurs and most recently Bolton. The reason Blackpool are in this trouble after such a strong first half of the season is a nine-game stretch from February to May where they failed to win a single game. The Seasiders are now four games unbeaten though, drawing three and winning one. For a newly promoted club, ‘Pool have an excellent away record, notching up five victories on the road this campaign. However, you have to go back to the end of December for their last win away from Bloomfield Road when they beat Sunderland 2-0. With only two points from the last six away matches, ‘Pool are 19th in the away form league, with a game tomorrow against the strongest home team in the division. With more than a little hint of bias, it’s not inconceivable to think Blackpool could get something at Old Trafford if Ferguson fields a team missing their big names, with their replacements also concentrating on the Champions League next week. Stats rarely lie however, and whatever team United field should on paper be strong enough to defeat the Seasiders. As ‘Pool have proved this season however, being the underdog does not faze them and they’ll be desperate to prove all the critics wrong. I cannot bring myself to tip a Man United win, but even containing United to a narrow win could be enough for the Seasiders. The time for rationality is over for Blackpool fans, and like last year at Wembley, it’s time to believe our club can achieve the improbable, by no means the impossible. Up the ‘Pool! Blackburn’s opponents Wolves were the last team to be previewed ahead of Sunday, now it’s time for Rovers themselves. After their draw against the champions last week, Rovers will hope to name an unchanged side from the one that faced Manchester United. Injury niggles had threatened the participation of Chris Samba, Jermaine Jones and Junior Hoilett, but they should be fit enough to start at Molineux. 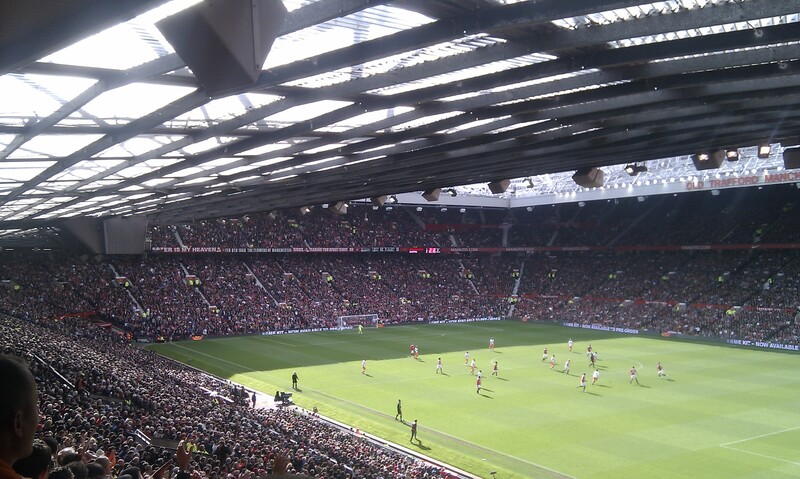 In the absence of the injured Ryan Nelsen, it is up to 19 year old Phil Jones to deputise at centre back. Since breaking into the first team set-up last season, Jones has demonstrated his class, as well as his versatility. Jones stifled Blackpool’s midfield at Bloomfield Road all the way back in September, but has also proven adept in the heart of the defence. With Wolves sure to be going for the win, Jones will need to support Samba in defence to get them the draw that would all but assure their safety. Rovers’ opponents on Sunday, Wolves, were covered on the blog in the previous article. Read it here. Blackburn have averaged a point a game over the most recent six results, with a win and three draws. However, Kean’s side have been on a steady decline shortly after his appointment, with only a solitary league victory since January – that win coming at Ewood Park against a Bolton side missing several key players. Rovers have been picking up the odd point here and there though, drawing six of their last 11 matches. Blackburn have struggled away from home this season and so a trip to Wolves wouldn’t be their ideal fixture. Rovers have lost two thirds of their away fixtures so far this term, winning just three away from Ewood Park. In fact Blackburn haven’t won away in 2011 which goes to show the size of the task facing them this weekend. It’s fortunate for Rovers that they had so many points before the managerial change as they might otherwise be in a lot more trouble than they currently find themselves. Already with 40 points and a superior goal difference to all the sides in the relegation scrap, it would take a lot to relegate them. A point should see them home, and even a defeat would require two of Wigan, Blackpool and Birmingham to win in order for Rovers to drop into the Championship. I’m tipping Rovers to be beaten at Wolves, but still fancy Kean’s side to live to fight another day, due to results elsewhere. That was the final part of this series looking at ‘Pool’s relegation rivals going into the final day. I’ll be back to dissect the aftermath, whatever happens on Sunday. Up the ‘Pool! Birmingham City were the last team in focus, now it’s time to examine their local rivals Wolves, who must face another team in trouble, Blackburn Rovers, at Molineux on the final day. With back-to-back wins using an unchanged team, it’s unlikely Mick McCarthy will make changes for the visit of Rovers. Having finally hit upon a winning formula, now is not the time to tinker. Top scorer Steven Fletcher has hit form at the right time with four goals in his last three appearances, which means Kevin Doyle will again have to settle for a place on the bench despite his return from injury. Despite his earlier season form being rewarded with an England call-up Matt Jarvis too will have to have to watch from the sidelines against Blackburn. He will be joined on the bench by one-time Blackpool target Sylvain Ebanks Blake and Nenad Milijas, who impressed at Bloomfield Road back in November. Adam Hammill, whose signature Wolves claimed in competition with the Seasiders will struggle to even make the 18. The goals of Fletcher have obviously been significant, but the contribution of Stephen Hunt in recent weeks has had a big impact. Hunt replaced Jarvis for the derby match against West Brom and was all over the pitch as Wolves charged into a 3-0 lead. Hunt has experience of these relegation battles from his time at both Reading and Hull and McCarthy should be able to count on him to help his side over the finishing line. 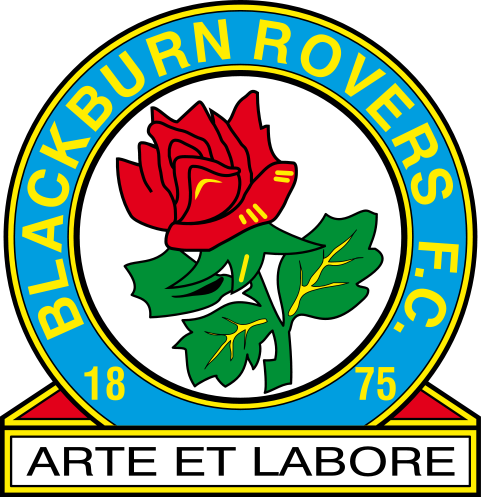 I’ll be taking a closer look at Blackburn tomorrow – check back then for an article dedicated to Rovers’ chances. Along with Wigan, Wolves are in the best form going into the final day. Like the Latics, they have taken eight points from the last six games, seven of those points coming in the last three. Moreover, Wolves have put consecutive victories on the board for the first time this campaign – they couldn’t have timed their run any better. Despite this, after taking seven points out of nine they are still not safe due to the form of both Wigan and Blackpool who have picked up crucial points in recent weeks. At Molineux Wolves have lost only six games this season, racking up an impressive eight home wins, including memorable victories over Man City, Man Utd and Chelsea. With the exception of the 4-0 thrashing of Blackpool though, McCarthy’s side have failed to make the most of their home games against the teams near the bottom. Wolves will still be confident however having lost only one of their last six home games and winning three. Of all the clubs in the relegation mix, Wolves fans should probably be most relaxed going into this weekend. They are at home, they have the form, they’re playing a struggling Blackburn side and even a defeat requires two of the teams below them to win in order for them to be relegated. Football fans being football fans of course won’t be without nerves, but I fancy Wolves to top the mini-league of all the teams in danger. Anything other than a Wolves win would be a surprise.